Salvation And Survival: What Does Your Personal Exodus Look Like? What Does Your Personal Exodus Look Like? I know that we live in an age where Faith is measured by New Testament standards; namely, trust in what Jesus accomplished at the Cross to secure our eternal salvation. But sometimes I have asked myself if, in never taking my eyes off Him, have I forgotten that Satan remains the "god of this world" (2 Corinthians 4:4) and still exhibits influence over the affairs of men? Not that I should focus on the Enemy, nor give him undue credit. And ultimately, I know his strategies do not threaten the Kingdom of God on earth. But as an ambassador for that Kingdom, I think it is important that I am aware the devil has blinded the minds of unbelievers to keep them from seeing the Light of the Good News of the glory of God in Jesus Christ. In addition, I want to make sure that His Light shines in me as a testimony for those unbelievers. 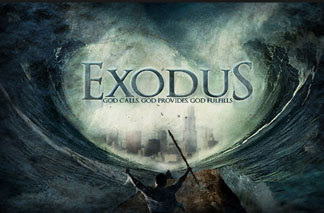 I want my personal faith to be as evident as it was in the Old Testament story of the Exodus from Egypt. Does my life reflect a full transformation from the Kingdom of Darkness [in which I once lived] to the Kingdom of Light? I ask this question because I know it is possible for our spirits to have hope in the Lord's promises while our flesh still hears the whispers of the Enemy -- the same compromises Pharaoh offered God for the continued enslavement of the Israelites. So I want us to take a look at the ways Pharaoh negotiated with God, so that we can see how the devil still works to control man and how we can work with God to expose these lies to His Truth and Light. It is important to recognize that from the beginning in the Garden of Eden, it has been Satan's plan to entrap man to worship him, rather than God. As long as Adam and Eve obeyed God and trusted Him, they were a threat to Satan's plan to steal the dominion of the earth. It is the same plan the devil was running in Egypt. Pharaoh was no fool. Although the Israelites had been enslaved for 400 years, they had never abandoned their worship of God. And Pharaoh knew what a powerful force that worship was in the midst of their slavery, and understood [just like the serpent in the Garden] that this faith/worship was a threat to his kingdom. So, the actions taken by Pharaoh show us just how Satan still works today in keeping both unbelievers AND believers from walking in total freedom. But knowing that God is the same today as He was yesterday, I can look at Satan's agenda and apply the Bible's unerring Truth to defeat those tactics in the same way God defeated them in the Exodus story. So, let's look at the compromises Pharaoh offered and see if we can recognize the devil's same strategy in the world today. Remember, that Moses, as God's ambassador had continually asked Pharaoh to let the people of Israel go so they could serve and worship Him. With each of Pharaoh's emphatic "No's", God sent signs and wonders to show His unrelenting love for His people. After a series of supernatural plagues, Pharaoh offers up a solution: “Go, sacrifice to your God [here] in the land [of Egypt].” Do you see the deal Pharaoh was offering? He was willing to let the Israelites worship their God as long as they remained in his land, where there would be no change in their circumstances. The devil is willing to offer us the same deal today -- we can do acts of worship as long as we still live "in the land" of his influences. Unless we dedicate every portion of our life to God, the devil still has legal access to influence our service to the Lord. When that offer didn't work, and Moses rejected the terms, Pharaoh tried another tactic: “I will let you go, so that you may sacrifice to the Lord your God in the wilderness; only you shall not go very far away. Plead [with your God] for me.” Here, we have a picture of Satan's temptation for us to offer half-hearted worship and dedication to God... perhaps we can have it both ways? Pharaoh will allow for some change, but not complete freedom; and it still gives him the means to control God's people. The same holds true for us today. We cannot say we worship God in Truth and Spirit, and still try to hold on to some aspect of the world. Full surrender of our lives to God may seem too extreme -- even to professed Believers. But I maintain that this is the minimum God desires. It is only through our willingness to serve and worship Him in the extreme that we can expect to be fully transformed and attain freedom. After more plagues from the God of the Universe, the next offer from Pharaoh struck a legitimate chord with me: “The Lord be with you [to help you], if I ever let you go with your children [because you will never return]! Look [be forewarned], you have an evil plan in mind. No! 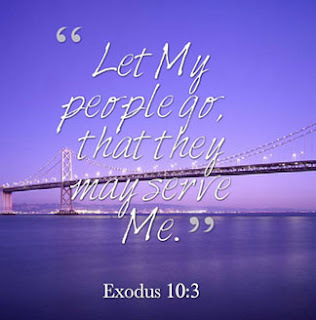 Go now, you who are men, [without your families] and serve the Lord, if that is what you want.” Pharaoh was offering the men of Israel their freedom if they would be willing to leave and abandon their children and families. Can't you see how that strategy has worked in today's culture? Whether it is unbelievers trapped in the welfare system, or believers who are chasing financial comfort, the family unit has been sacrificed for what the world likes to call "freedom". [And this doesn't even begin to cover how we have neglected to keep watch over technology and the internet and how it is enslaved our children, resulting in the breakdown in communication and identity]. But God's plan is the same today as it was in ancient Egypt: to keep families together to build generations of faithful people to honor and glorify Him. The question is this: Are we partnering [and parenting] with Him to see that happen? Or do the members of our families each go their own way, often outside of relationship with the Father? And now we see Pharaoh's final attempt to keep God's people in compromised slavery: “Go, serve the Lord; only your flocks and your herds must be left behind. Even your children may go with you.” In the ancient system God had set up, it was these flocks and herds of animals the Israelites needed for sacrifice to show their worship of God. If Pharaoh could convince them to give up their means of sacrifice, their worship would be meaningless. Nothing has changed. Today, we face the same test. Are we ready to dedicate all our resources to the worship of our Lord? Or are we governed by our fear that we might not have enough if we give it all? If we operate out of that fear, then the Enemy has been given legal permission to influence our minds, our emotions, and our will to fulfill our purpose for the Kingdom. This is Satan's greatest fear... families who are willing to worship God with all they have; willing to go to the extreme to please and serve Him. Nothing will be denied these kinds of people and the devil knows it. They are capable of defeating his every move and they are a real threat to his earthly realm. In the end, the fate of the Israelites didn't depend on Pharaoh capitulating to God's demands to let His people go. Their fate depended on their willingness to trust Him when He told them to cover their doorposts with the blood of a sacrificial lamb. If they had not decided to "go all in" with God, they would have suffered the same consequences from the Angel of Death that the Egyptians experienced. Because they were obedient out of their faith, they received their freedom. God rewards us the same way today. We are called out of our captivity into the glorious Light of a life in Christ. When we are willing to be uncompromised -- to go to extremes to worship Him in fullness and trust -- then the Enemy has no hold on us; and we discover the purpose of our deliverance into freedom. We are brought out of our slavery in the Kingdom of Darkness and into the Kingdom of Light in our Promised Land. And no matter how long our Exodus journey is, it is worth every obstacle we face; every rejection from this world, because we are covered by that same blood of The Sacrificial Lamb and consecrated to Him alone; worshiping Him alone. We have been delivered out of our captivity into freedom, and we will sing His praises, for He is worthy to be praised! Ephesians 5:8 Once your life was full of sin’s darkness, but now you have the very light of our Lord shining through you because of your union with him. Your mission is to live as children flooded with his revelation-light!